Juneau gained its fifth sister city this weekend. Representatives from Kalibo in the Aklan Province of the Philippines signed documents Saturday afternoon to formalize the agreement. Juneau and Kalibo are both vibrant tourism centers and regional capital cities. 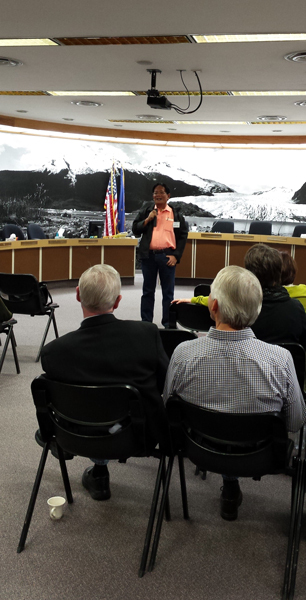 About 3,000 Filipinos live in Juneau and roughly 800 of them are from Aklan. Vicky Roldan is one of them. She’s been in Juneau for 21 years and says family is the reason so many Kalibo residents move here. Alex Carrillo was born and raised in Juneau and says the Filipino population has always been a tight-knit community. He says Juneau’s bond with Kalibo is more than just a sign of good will toward the Philippines. While in Juneau, the Kalibo delegation did some sightseeing including visits to the Mendenhall Glacier and the Shrine of St. Therese. They also visited local businesses, like the Alaskan Brewing Co. Many expressed hope that the sister city connection will encourage an exchange of goods, services and information. Dr. Makarius Dela Cruz is Kalibo’s municipal health officer. He says Aklan needs support to provide better health care to its residents. Typhoon Haiyan hit the Philippines last November and damaged buildings in Aklan. Juneau’s Filipino Community Inc., or FilCom, reached out to those affected across the Philippines. Larry Snyder is on the Juneau Sister Cities Committee. Seafood is important to both Southeast Alaska and Aklan. Jenny Gomez Strickler is the Philippines’ honorary consul to Alaska. She wrote to Alaska Airlines to explore the possibility of a direct flight to Manila that could increase the amount of fish exported. She says there are products that people in the Philippines could use that would otherwise go to waste in the United States. John Pugh is the chancellor of the University of Alaska Southeast. He says there could be a trade in education. If the sister city relationship is successful, members of both communities hope it will also spark more tourism.